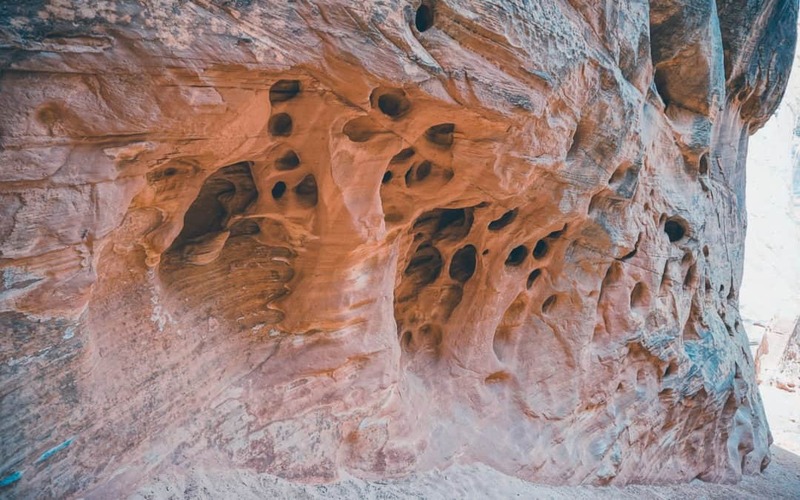 After hiking Spooky and Peekaboo Slot Canyons, we couldn’t wait to get out and explore more of them! We headed over to the visitor’s center in Escalante and asked them for more suggestions. They pointed us toward Cottonwood Narrows, just south of Cannonville Utah. 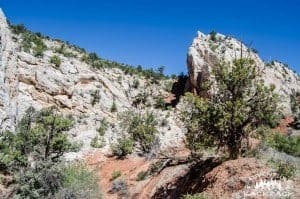 We were about ready to head out from our boondocking campsite in Escalante anyway, so we headed towards Cannonville to hike the Cottonwood Narrows. The road going to the Cottonwood Narrows trailhead is very rough. We had to do some strategic driving to get Daypack (our Fiat) over and around some of the troughs and rocks. It would be ideal to have a high clearance vehicle (a 4×4 isn’t necessary, but higher clearance than a fiat), but we made it in Daypack, so it’s generally accessible if you are a skilled maneuverer! There are two trailheads for the Cottonwood Narrows; a north trailhead and a south trailhead. You can hike from either direction and either as an out and back trail or a loop via the road between the two trailheads. We chose to hike it as a loop, so a mile of it was on the road. But, since hiking on a road is generally no fun, we left Daypack at the South Cottonwood Narrows trailhead and biked back up to the North Cottonwood Narrows trailhead. So although our trip was technically a 3-mile loop, we rode our bikes one mile of it. Great idea, we highly recommend you doing that! Although it was mainly uphill on the bike ride, it was still better and faster than hiking it. Your other option would be just to hiking Cottonwood Narrows as an out-and-back, which is another good option. At the North Cottonwood Narrows trailhead, you actually start the trail across the street from the parking area and trail marker. Once you cross the road, you will see several trails seemingly leading in all different directions. They actually all lead to the same place, but are different ways to get around the first washout. If you follow the wash around, there is a little drop-off that you have to scramble down (or jump down, like Steph did). It’s very small, and for us that was easier than hiking down a super steep hill with no switchbacks. Once you are in the canyon, the hike is very easy. The trail follows the canyon for two miles, and the path is mostly sand and rock. There are only two obstacles, which actually both have a path around them if you choose not to scramble down the boulder field. There is a side canyon about a mile and a half into the hike from the north trailhead. 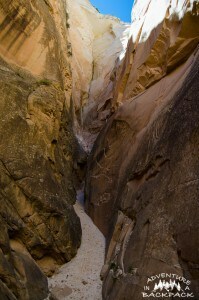 This side canyon is not too long, maybe about 100 yards or so, and is worth the little side trip to check it out! Unfortunately, we were told this was a slot canyon and it absolutely was NOT a slot canyon. This is a very wide canyon, closer to what I would describe as a wash or just a canyon. It never gets tight at all and would unlikely be subject to flash flooding without an absolute torrential downpour that lasted for several days. 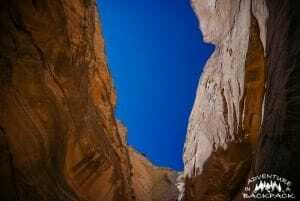 Again, not a slot canyon. However, the hike was absolutely gorgeous and we still enjoyed it! We did rate this trail as only two stars, simply because we were expecting it to be a slot canyon as well as the location and lack of proximity to anything. Therefore, it did not meet expectations. However, it was still a great hike and if you are looking for an easy hike near Cannonville, we highly recommend hiking Cottonwood Narrows! 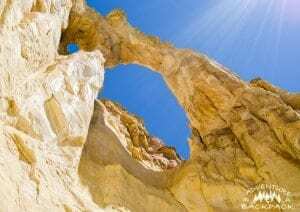 On the way out from Cottonwood Narrows, we stopped at a natural double arch called Grosvenor Arch. This is just a quick about 100 yards off of the road, and there is a sidewalk to it. It’s out in the middle of nowhere, so it’s not very busy and we were the only ones there when we went. It’s worth the side trip if you are coming from Cottonwood Narrows or any other locations near there. Be sure to follow us on our social media sites and subscribe for more updates! Until next time, Live Vicariously!